When I set out on my around the world backpacking trip last October, my backpack weighed 14 kilos and my daypack (which I wore in front) weighed nearly 10 kilos –that’s over 50 pounds! When I arrived at my first hostel in Paris, I was exhausted and in actual pain from carrying the unfamiliar weight up steep flights of stairs in the city subway system, and walking what felt like miles through three airports. A week later, in Prague, I shipped about 10 pounds of miscellaneous stuff back home, having realized that I needed to lighten my load if I wanted to enjoy my trip. The capsule concept is key; everything must go with everything. If you’re traveling through different climates, pack for the first destination. If it’s within the budget to buy new clothes when you arrive somewhere warmer/colder, then do that. If your budget is tight, consider shipping yourself a box of clothes to pick up along the way, or hit up a secondhand shop or local market when you arrive in a new climate. For my around-the world trip, I kept a swim suit, a pair of Athleta yoga tights and a lightweight down jacket throughout the entire journey. Everything else got lost, worn out, and replaced many times over along the way. Quick dry clothes that resist getting stinky and wick away sweat are awesome, as are loose-fitting, lightweight, breathable cottons. Choose darker, basic colors (black/grey) and stick to one or two accent colors to keep everything matchy-matchy. I prefer white to black, and can’t tell you how many white shirts I destroyed during my trip, while I kept the same practical black and grey tops throughout the entire journey. Ultralite backpackers may only bring 2 changes of clothes (one to wash, one to wear), but I found it was easiest to have enough clothing to last about a week between washes. For an around the world trip, you really only need three pairs of shoes. Pack a pair of shower/beach flip flops, sneakers or running shoes you can walk up to 10 miles in (I love my Nike Airs), and either cute, dressy sandals or ankle boots, depending on your destination. Nope, don’t even think about bringing heels. Keep your backpack from turning into a humongous black hole. Invest in packing cubes, zippered pouches,a compact reusable shopping bag and ziplock bags. Strangely, it’s hard to find ziplock bags anywhere outside of the USA and Australia. As quickly as possible, develop a system so you know exactly where everything in your backpack goes –especially your passport, wallet, cell phone, keys, lock and chargers –it will prevent you from losing stuff. Before leaving anywhere, do a quick check to make sure you have the big 3 –wallet, passport and cell phone. Whatever you enjoy doing or want to learn how to do, you will have plenty of time to play and create on your journey around the world. It’s worth the weight, so go ahead and pack those tarot cards, journal, tape, pens, watercolors, scissors, a deck of cards, travel size cribbage, poi, juggling balls, a frisbee, ukelele or harmonica, a foldable hula hoop…get creative and have fun. I picked up a deck of The Wild Unknown tarot cards in Bali and have absolutely loved having them along on my journey, since they are both a fun group hostel activity and a meditation/soul-searching aid whenever I am faced with a challenging situation on the road. Do more, better in the dark. ‘Nuff said. Many hostels and hotels will provide towels, but it’s helpful to have a small travel towel for the times when they don’t. Beware; a travel towel will still get stinky, even though it dries fast. Just don’t forget about it for days in the bottom of your backpack! Bring a lightweight and versatile sarong/scarf you can use as a beach towel, scarf, blackout curtain, tablecloth, picnic blanket, actual blanket, seat cover etc. This is one of the most useful items you can bring, and it weighs practically nothing. Of course, if you are traveling anywhere in Southeast Asia, you can easily pick one up when you arrive, although having a sarong that matches your capsule wardrobe is ideal. I picked up many new ones along the way (and still regret losing my all-time favorite at a hostel in Sri Lanka). My personal arsenal of travel electronics includes a Macbook Air, unlocked iPhone 5s, Kindle, Olympus OEMD 10 camera, external hard drive, a portable power bank and assorted chargers. I wished I had a GoPro for all the water activities I did. Yes it’s annoying to carry all of this, but I used everything a lot. If you aren’t blogging/working/shooting tons of photos that you need to back up, you could easily ditch the laptop. Invest in protective gear for your electronics –I dropped my iPhone in a hostel toilet within the first week of my trip and destroyed my camera in a blizzard in Nepal. Sh*t happens when you travel…which brings us to #9, travel insurance. I use World Nomads. It’s easy, affordable and covers electronics, baggage and medical emergencies. Seriously, don’t leave home without insurance. I used a USB plug bank and universal travel adaptor every single day to keep my devices powered up. I traveled without a surge protector, and didn’t have any issues. You can buy basic toiletries just about everywhere, including tampons and makeup, so there’s no need to bring a year’s supply. The more multipurpose items you bring, the better. Coconut oil, Doctor Bronner’s soap, wet wipes, hand sanitizer and dry shampoo are among my essentials. Confession –I never managed to get my many toiletries down to what I considered an appropriate backpacker-sized collection. Any tips on doing this would be much appreciated. Obviously, you will need a durable backpack to carry your stuff in. My around-the-world backpack was this women’s specific pack from Sierra Designs (mine is 65 liters) and my daypack was this awesome, water-resistant, ultralight pack from Marmot. This Osprey pack was also super popular among travelers, and includes a zip off daypack. If you are spending more time in cities, you may want to opt for a trendier daypack that will look cute in photos. Just remember –it’s helpful to have a few zip pockets for organization, and a backpack that actually closes, so you aren’t as worried about pickpockets. Unless you are traveling to the Sahara desert, find a way to waterproof yourself and your stuff… at various times, I carried an umbrella, raincoat, poncho and waterproof backpack cover. I also bought a waterproof bag in Thailand for boat trips so I could bring my camera, cash and phone. I travel with a small wallet or coin purse, an actual purse and a money belt. I only use the money belt in places where pick pockets are a huge problem, or when arriving in a new country if I am still feeling out the risk of getting robbed. After that, I either throw my wallet in my backpack or my cross body purse. Pay attention to what the locals do… for example, on most crowded European subways, you’ll notice the locals keep a hand firmly on the opening of their purse or wear their backpacks in front. Do as they do. Seriously, don’t think I ever used anything inside my waterproof first aid kit, but I felt better having it, and it weighed practically nothing. Oh wait, there was that time my friend got 10 stitches in a remote village in Sumbawa. Yep, used it then. Also, you or a friend will probably get blisters at some point so pack some band aids and antiseptic cream. Other good things to have include anti-malarials (if traveling somewhere with malaria), a round of antibiotics for food borne illness, and some basic painkillers like ibuprofin. You will need a lock to use the lockers at most hostels, and a retractable cable lock comes in handy if you are doing overnight travel and need to leave your bag in an overhead storage or a bit out of reach. Of course, a cable isn’t going to stop someone from unzipping your pack, but it will stop them from walking by and grabbing it when you aren’t looking. Keep your pack within view whenever possible, and keep your valuables with you at all times in your daypack. I traveled with a PacSafe wire mesh bag locking system, which did set my mind at ease in situations where there were no lockers or I wasn’t able to keep an eye on my bag. It was heavy and I didn’t use it as much as I expected to, but peace of mind is worth plenty. Write out a bucket list of experiences or the reason why you are traveling. For example… ‘go to a yoga retreat, scuba dive with whale sharks, see the northern lights, write the first draft of a book, connect with people from all over the world.’ Refer to these things often and you will find your around the trip is as fulfilling and life-changing as you have dreamed it will be. 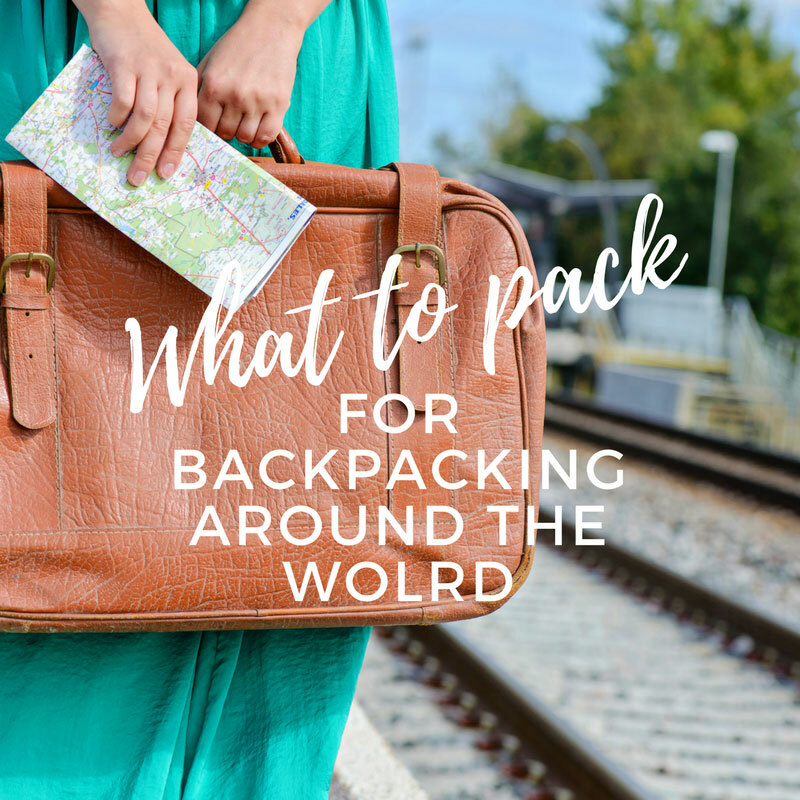 What are your around-the-world backpacking trip essentials? Please post in the comments section below. Psst! This post contains affiliate links, which means if you click one of these links and actually buy something from Amazon, I get paid cash money, which helps keep this travel blog afloat by paying for things like web hosting. Everything listed in this post is honestly stuff I have used (and abused) during around the world travel.